The SERIES 490A Hydronic Differential Pressure Manometers are versatile, handheld, battery operated manometers available in several basic ranges for positive or positive differential pressure measurement and can tolerate most liquid media compatible with 316LSS. A new feature added to the Series 490A is a field adjustable damping, which allows the user to choose the level of display averaging rate corresponding to the fluctuation level common in many applications. NEW! 490A-HKIT Option is located in the Product Configurator. 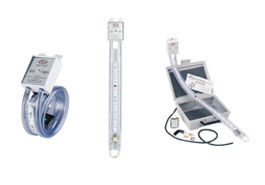 Hydronic meter kit includes: (2) six foot high-pressure rated tubing with shut off valves, high pressure 3-way valve, 8 ft poly tubing for purges, hard travel case, handheld carrying strap, 1/16" x 1 1/2", 1/8" x 3" and 1/8" x 1-1/2" pairs of pressure probes, 90° Flare to 1/4" NPT fittings, adjustable 8" wrench, PTFE Tape, and magnetic protective rubber boot. NIST Calibration Certificate comes standard. Dwyer Instruments, Inc. was recognized for excellence in product design in the 14th annual Dealer Design Awards Program sponsored by The Air Conditioning Heating & Refrigeration News magazine (The ACHR News). An independent panel of contractors acted as judges in the contest that had 81 entries. 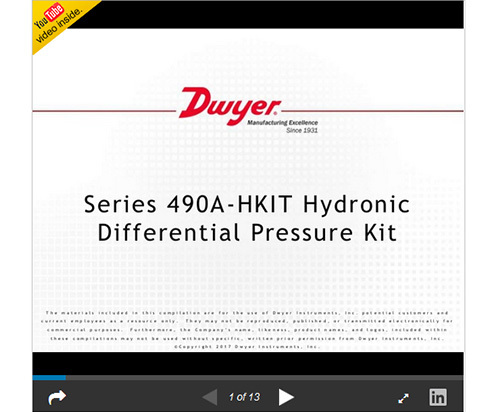 The company’s Series 490A-HKit Hydronic Differential Pressure Manometer was the Bronze Award Winner in the Electronic and Hand Tools category. The ACHR News is the leading trade magazine in the heating, ventilating, air conditioning, and refrigeration industries. To read the full announcement please visit http://www.dwyer-inst.com/2017DDABronzeWinner. Without valve: 316L SS, -3V option: 316LSS, Buna-N, silicone, grease, PTFE, brass 360, copper, reinforced acetal copolymer. ±0.5% FS, 60 to 78°F (15.6 to 25.6°C); ±1.5% FS from 32 to 60°F and 78 to 104°F (0 to 15.6°C and 25.6 to 40°C). 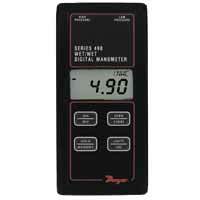 EXAMPLE 490A 1 AT Series 490A-1-AT Wet/Wet Handheld Digital Manometer, range 0-15.00 psi, with aluminum tag.